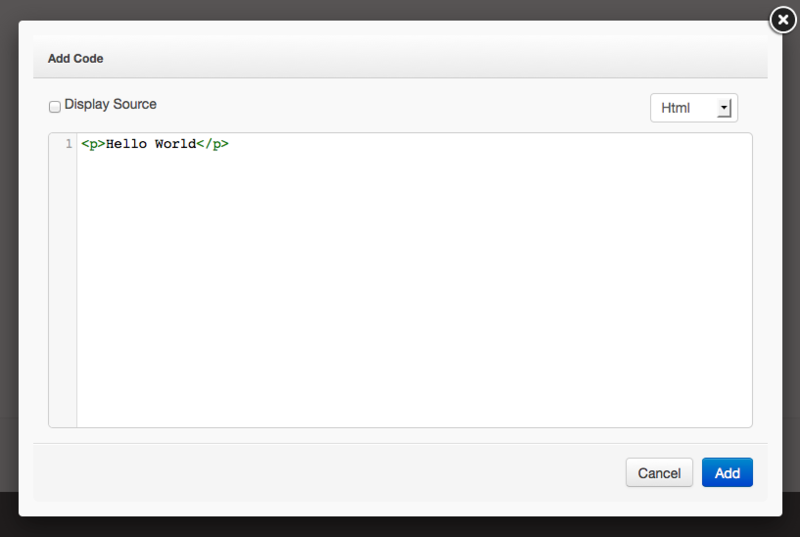 The Page Editor is what you will use to add and edit content to the pages on your SquareHook site. It is very simple to get started. This is also where you will chose which layout you would like for this specific page. Some of our templates will include multiple layouts that include or exclude certain elements from the layout such as: Image carousels, sidebar features etc. Note: It is very important that you have the correct page layout settings on each page. 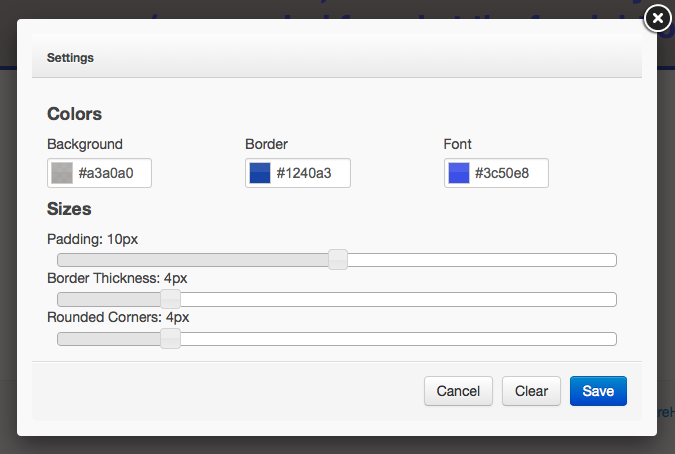 There is a tab called Layouts that contains a dropdown that allows you to chose what layout you want set for that page. Each theme contains different types of layouts for different pages. For example: The "home" layout might contain a rotating carousel in the header of the page. 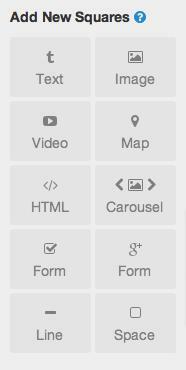 Therefore you must have the layout set to "home" on the page you want to display this carousel. However, if you see a carousel that you do not want to appear on the page, you may need to set the layout to "layout" instead of "home". To begin, select the page that you want to add content to. There will always be a Add New Squares sidebar on the right side of the Editor. Drag the square over to the specified are you'd like, to be begin customizing your page. 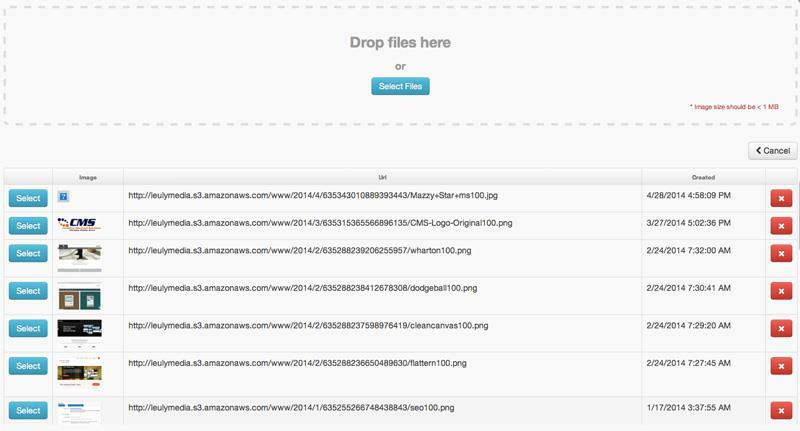 The Image square allows you to upload an image from your computer directly to your website. When you select the "Image" icon, a window will open that allows you to either "upload" an image directly from your computer, or you can drag an image into the dotted box area. You can also click on an image that has been previously uploaded and a square containing that image will be placed into your layout at the bottom. A great thing the SquareHook tool is that you only have to upload the image once, and it will automatically be re-sized according to the device it is being viewed on. 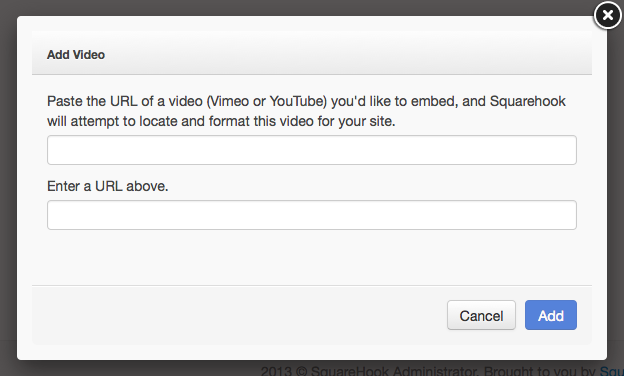 The Video square allows you to upload a YouTube or Vimeo flick on your site with ease. All you have to do is click on the "Video" square, where you will type in a URL that links to a video on either YouTube or Vimeo. The video can then be moved around in the layout where you want it to appear. Our tool will automatically re-size the videos to fit the screen on any device. The "Map" square allows you to embed a Google Map into your site. This is great for helping customers locate you or your business' locations. It's very simple to implement into your site. 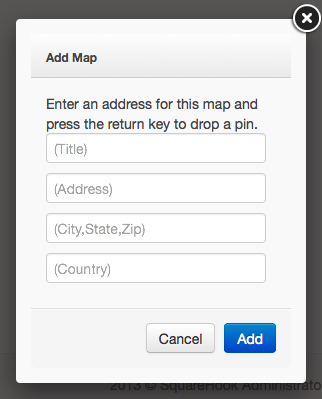 Just fill out the address information on the form that pops up, click the "add" button and the map will be added to your site. Are you not getting exactly what you need? The HTML square is an advanced square for those needing very specific inclusions in your site. You can inject HTML code and our tool will render this into content for you website. Our tool has the ability to upload a Google form into your website and it is easy to implement. Simply go to http://www.docs.google.com and click on the red "create button. At this point you can chose between a variety of document tools provided at no cost to you by Google. Once you have created the form or document, Google docs will provide you with a URL to paste into your site. Copy this URL and paste it into the "Google Form" Square in our tool. Once this is complete, click on the Publish button and it will be active on your website. You can create a fully customized form using our tool. We provide you with 'name, text, and message' fields, which you can move around the order of their display. 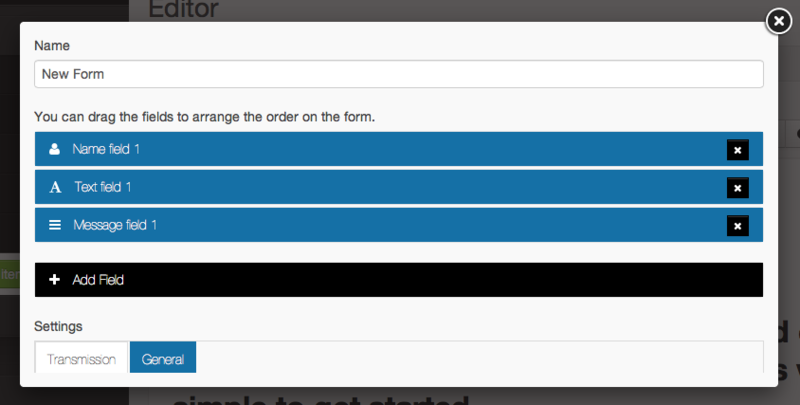 There is also an '+add field' option to add more fields to your form. You may also customize your SUBMIT button and the 'thank you message' under the General tab. Note: Make sure that once you have created the form to your liking, you scroll down and make sure the transmission is directed to the email where you want to receive the results ! The Space square, like the Horizontal Line square is a visual element that helps you divide content on your website. This is to vertically space layouts and separate content. The Horizontal Line square, like the space square is a visual element that helps you divide content on your website. This can be used to show that a new section of a page has begun, or simply to be used to divide content. 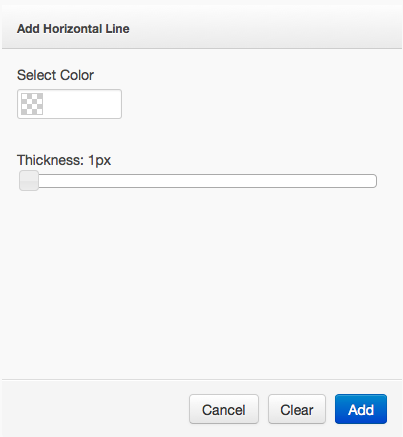 You can choose the horizontal line's thickness, its color, and the opacity.